Don Ernesto Zucchini illustrates the most surprising aspects of the life of the mystic of Viareggio to whom, on October 22 and 23, [2016,] will be dedicated an international conference. Many wonder who Maria Valtorta is and why her life and her writings capture so much attention, and it is precisely for those who are still unaware of her that the Valtorta Foundation has organized a first international conference to become familiar with the prodigies of the mystic of Viareggio, who is known in the United States, Canada, Europe, Oceania, Australia, as well as Italy, where she lived until her death, in 1961. For the first time in Italy, on October 22 and 23, [2016,] an international conference will be dedicated to the study and knowledge of Maria Valtorta. ZENIT has attempted to reconstruct the story of the visionary from Viareggio and to understand why, 55 years after her death, people still examine her life. We have talked with Don Ernesto Zucchini, the 70-year old president of the Fondazione Maria Valtorta [the Maria Valtorta Foundation], professor of theology since 2009 at the Scuola di Formazione Teologica [School of Theological Training] of the diocese of Massa Carrara, the main speaker in a Radio Maria broadcast on the mystic, and parish priest at Pontremoli, in the province of Massa Carrara and in four other, neighbouring localities. Don Ernesto, who was Maria Valtorta? Maria Valtorta was born in Caserta on March 14, 1897, in a very pious family of Lombard origin, and died at Viareggio on October 12, 1961. A fervent Catholic since early childhood, doing well in classical studies, she attended the prestigious college Bianconi at Monza, where she excelled in literature. She had a turbulent relationship with her mother, Iside, who forbade her to get married and have her own life, but despite that, Maria would never cease loving her and professing the Faith. She would be very greatly devoted to Jesus from her youth and would go so far as to offer her life several times to the Divine Justice to save as many souls as possible in union with Jesus Christ. Starting on Good Friday in 1934, she would be bedridden in a small room on the ground floor of the little house at 257, via Antonio Fratti, in Viareggio, as the result of a tragic event that occurred to her in 1920, when she was attacked by a deviant, who irremediably injured her spine. From then  on, she was never to stand up. Her spirituality was to develop into a mystical state and she was to have the gift of interior locutions and very richly detailed visions of the entire Gospel. Thanks to her first spiritual director, Fr. Romualdo Migliorini of the Servants of Mary, she would write everything even if she was overcome by fatigue and pain due to the seven serious illnesses or malfunctions that afflicted her, including pleurisy, paralysis of the lower limbs, and spinal lacerations. In which way did she see? The gift that Maria Valtorta received, consisted in seeing every detail, observing, hearing, and being such a participant as to perceive simultaneously both the climatic variations and the perfumes of that time. In other words, Maria Valtorta was physically present to what she was shown. Is that why she is still famous today? Yes, certainly on account of that gift, but above all on account of the result of her visions, that is, her writings on the Gospel. Initially, it was called Il Poema dell’Uomo Dio [The Poem of the Man-God], and now it is known as L’Evangelo come mi è stato rivelato [The Gospel as Revealed to Me], which is published in ten volumes. Other works followed: though not “minor”, they nevertheless are less striking. Did Maria Valtorta have visions of the Virgin Mary? How were they? Yes, certainly, she had some, and they were very, very detailed, from her clothing to the way she did her hair. Even today, that is bewildering, and some critics would like to expunge those descriptions – in France, a translation has removed those parts – which are confirmed, instead, by the Gospel. And yet, it is those details that make us understand that Maria Valtorta did not write a novel. Not even a historical novel. And even less a historical dream full of nonsense. Since 2012, thanks to the French engineer Jean-François Lavère, we have known with evidential certainty that the “environment” described by Maria is scientifically precise. That is exactly what is astounding. In fact, it turns all the pages written with preconceived ideas and biases upside down. Whoever reads Maria Valtorta must know that everything is scientifically certain, even the positions of the stars. And Maria Valtorta never makes a mistake! The provocation is certainly strong, very strong, for everyone. Did she also have visions of Jesus? All the characters of the Gospel are real, not papier-mâché or distorted. Jesus, Mary, and St. Peter and all the apostles, including Judas Iscariot, are people in the flesh, concrete and real. And the most holy humanity of Jesus emerges resounding, infinitely beautiful, and engaging. At times we literally seem to touch Him. All of that without diminishing His Divinity. In Maria Valtorta, Jesus is just as the Church has been dogmatically announcing Him for 2000 years: true God and true Man. It is interesting to know that the very first critiques, of the first Italian edition, bore exactly on Jesus’s excessive materiality. Too human, too lovingly close to His Mother, and too close to women. But nowadays such critiques bring up smiles. It was the “air” of those ‘50s that pretended that Jesus was so Divine as to make His real humanity almost disappear. What is the purpose of the Maria Valtorta Foundation? The Maria Valtorta Foundation has three fundamental purposes clearly described in its statute, in chapter III. “The Foundation is dedicated to the exclusive pursuit of cultural aims and principally the utilization of every useful and legitimate instrument for the development, documentation, and spreading of the knowledge of the writings and person of Maria Valtorta and, through that, [is dedicated] to the affirmation and rediscovery of the Judeo-Christian roots of our civilization, placing itself, always and without wavering, inside the doctrine taught by the holy Catholic, Apostolic, and Roman Church”. That is, to deepen and spread with every licit means the knowledge of the person and the Work of Maria Valtorta. And to defend the Christian roots of Europe, which are so widely attacked nowadays. Where is the beatification process at? It is completely still. 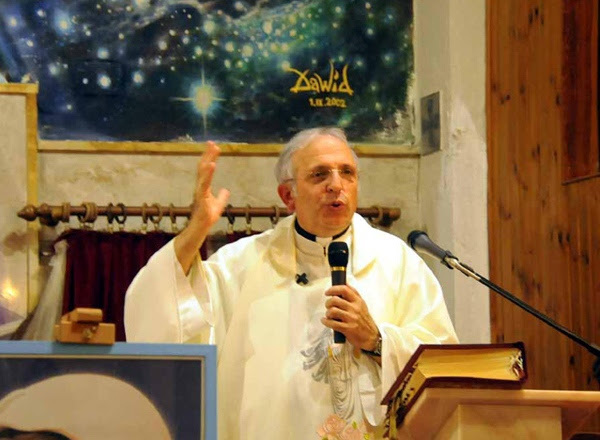 In the sense that it must be the Bishop of the Diocese of Maria Valtorta – that is, Lucca – who starts the beatification process. The person and the work should remain distinct, but in this world, the two planes tend to be confused, which prevents even the very start of the process. On the other hand, 56 years of history have not gone by in vain. Those in favour and those against, every one of them, insists on one’s own thesis. In any case, there are two preliminaries that must be proven: Maria Valtorta was not a spiritist, was not a medium, and was not a new-ager; Maria Valtorta has not written “a poorly novelized life of Jesus” and not even a historical novel. My personal conviction is that the Church (with a capital C) will not move until those two facts have been clarified in depth. For which reason do you think that God has chosen precisely Valtorta, among many? Is there a vision in particular that, because of its thoroughness, has remained particularly impressive to you? Frankly, there are so many. I remind you that the Gospel has 652 chapters and 705 characters, so the choice is wide open. Still, the episode of the temptations in the desert is very intriguing (chapter 46, in volume I). The encounter is truly realistic, involving, dramatic, and with an enchanting literary form. Maria Valtorta never shows the thoughts and the motivations of the characters that she depicts, but the realism is absolute. The explicitation of the canonical Gospel is very strong, but there is never the pretense of proposing a fifth gospel even when the novelties seem very many. For example, here there are four temptations, because the very first is an inducement to Jesus to take a wife. Translated from the original Italian article on Zenit News, with permission of the author.